MISSISSAUGA, ON, March 31 /CNW/ – Phonetime Inc. (TSX: PHD), a leading global supplier of international long distance telecommunication services, today reported its financial results for the fourth quarter and year ended December 31, 2008. All figures are in Canadian currency. Consolidated revenue for the fourth quarter ended December 31, 2008 was $42.2 million, representing an increase of 43% when compared to $29.6 million for the fourth quarter of 2007. Consolidated revenue for the 12-month period of 2008 was $157.2 million, up 60% from $97.9 million for the 12-month period of 2007. The growth is attributable primarily to higher sales volumes of the Company’s Wholesale Division, which buys and resells telecommunications long-distance services to telephone carriers around the world using Phonetime’s proprietary call trading platform. Phonetime also generates revenues through its Retail Division, which provides pre-paid calling cards and long-distance services to targeted ethnic consumer groups across Canada. Gross profit for the fourth quarter of 2008 was $4.7 million or 11% of sales compared to $4.5 million or 15.1% of sales for the fourth quarter of 2007. The margin decline is primarily attributable to the depreciation of the Canadian dollar. Gross profit for the 2008 fiscal year was $20.4 million or 13% of sales compared to $12.4 million or 12.7% of sales for the 2007 fiscal year. The year-over-year gross profit improvement is due to higher sales volumes experienced by both the Wholesale and Retail Divisions. Phonetine generated an operating loss of $0.1 million for the fourth quarter of 2008 compared to an operating income of $0.6 million for fourth quarter of 2007. Operating income for the 12-month period of 2008 was $5.3 million, up 253% from $1.5 million for the 12-month period of 2007. Phonetime produced a net loss for the fourth quarter of 2008 of $1.7 million or $0.01 per basic share compared to a net loss of $0.1 million or $0.01 per basic share for the fourth quarter of 2007. 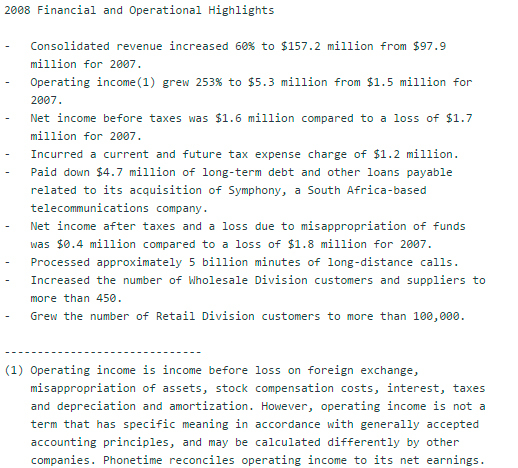 The net loss included a bad debt allowance of $425,000 in response to deteriorating credit and economic conditions facing several Wholesale Division customers as well as a currency conversion charge of approximately $700,000 relating to Symphony acquisition debt, which was originally denominated in US currency. Net income for the 2008 fiscal year was $0.4 million or $0.01 per basic share, and included a loss of $0.2 million due to audit, legal and asset recovery activities stemming from a previously announced misappropriation of funds. 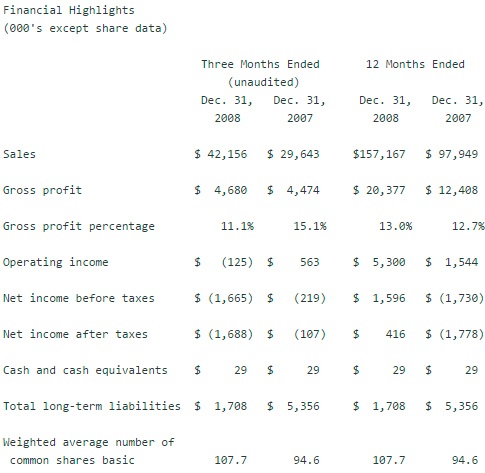 In 2007, Phonetime produced a net loss of $1.8 million or $0.02 per basic share. The year-over-year improvement was principally due to performance gains by the Company’s Wholesale and Retail Divisions. As at December 31, 2008, Phonetime held cash and short-term investments of $0.03 million as well as accounts receivable of $13.9 million. Phonetime will file its consolidated financial statements for the fourth quarter and fiscal year-end 2008 and related management’s discussion and analysis with securities regulatory authorities within the applicable timelines. The material will be available through SEDAR at www.sedar.com and the Company’s website, www.phonetime.com. Phonetime will host a conference call to discuss its 2008 fourth quarter and year-end financial results on Wednesday, April 1 at 10:00 a.m. (ET). The Company will report its financial results via a news release on Tuesday, March 31 following the close of markets. To access the conference call by telephone, dial 416-644-3415 or 1-800-732-9307. Please connect approximately 15 minutes prior to the beginning of the call to ensure participation. The conference call will be archived for replay until Wednesday, April 8, 2009 at midnight. To access the archived conference call, dial 416-640-1917 or 1-877-289-8525 and enter the reservation number 21297431 followed by the number sign. A live audio webcast of the conference call will be available at www.phonetime.com. Please connect at least 15 minutes prior to the conference call to ensure adequate time for any software download that may be required to join the webcast. The webcast will be archived at the above web site for 30 days. This press release contains forward-looking statements, which may be identified by words like “expects”, “anticipates”, “plans”, “intends”, “indicates” or similar expressions. These statements are not a guarantee of future performance and are inherently subject to risks and uncertainties. Phonetime’s actual results could differ materially from those currently anticipated due to a number of factors set forth in reports and other documents filed by the Company with Canadian securities regulatory authorities from time to time.